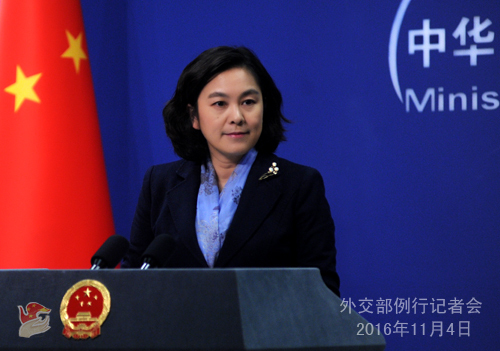 BEIJING, Nov. 4 -- China on Friday urged Britain to live up to its commitments with China on Tibet. Foreign Ministry spokesperson Hua Chunying made the remarks when asked to comment on a meeting between Lobsang Sangay, the "prime minister" of the "Tibetan government in exile," and John Bercow, speaker of Britain's House of Commons, on Tuesday. China voices strong dissatisfaction and firm opposition to the Bercow-Sangay meeting, for it severely damages China's core interests, Hua told a daily press briefing. Lobsang Sangay is a secessionist and the ringleader of the self-proclaimed "Tibetan government in exile," which has no legitimacy at all, she said. On March 10, 1959, after a failed armed insurgency, the Dalai Lama fled abroad. The so-called "Tibetan government in exile" is an illegal organization, and not recognized by any established government in the world, said Hua. The Chinese government resolutely opposes secessionist activities by the ringleaders of the Dalai Lama clique in any country, in any capacity and under any name, she said. China is also firmly against any contacts between any foreign officials and the leaders of the clique, she added. She urged the British side to fulfill its commitments on Tibet and refrain from interference that damages China-Britain relations.